Eggplant Parmesan has been a favorite of mine for years. This meaty vegetable is a perfect meatless-meal that everyone will enjoy. I would always egg it, bread it, fry it, and bake it until I realized I could SKIP the frying process and it would still taste just as great! This slims down the meal quite a bit, plus you get to skip the cleaning of the greasy pans- 2 big wins in my book! Try my eggplant parm bake tonight, but make extra because you and your family are going to want seconds! -Peel eggplants with a vegetable peeler. -Cut off both ends of the eggplant, then cut the eggplants into 1/2" thick rounds. -Lay the eggplant on a clean counter in a single layer and sprinkle with salt on both sides. -After about 20 minutes, eggplants will have released some liquid. Pat the eggplants dry with some paper towels. -Beat the eggs with 2 tablespoons of water in a medium sized, shallow bowl. -In a larger, shallow bowl mix together the breadcrumbs, flour, and 1 tbs. of the parmesan cheese. -Dip the eggplant into the egg, letting the excess drip off. -Place the eggplant into the breading, shaking off excess. Place breaded eggplant onto a baking sheet. -Continue to egg and bread each piece of eggplant. When finished, spray or drizzle a little bit of olive oil on each piece. -Bake in a 375 degree oven for 20 minutes, flipping the eggplant rounds half way through. -Cover the bottom of a 9x13 casserole dish with 1/4 cup of tomato sauce. -Layer the bottom of the dish with a single layer of eggplant. -Cover each eggplant with about 2 tbs. of tomato sauce and 1 tbs. of shredded mozzarella. Sprinkle some parmesan on top of the layer. -Continue to layer in this fashion until all the eggplant pieces are used up. Make sure the top layer is sauce then cheese! -Cook in the 375 degree oven for an additional 20-30 minutes, until cheese is melted and eggplant parm bake is hot and bubbly. -Let cool, serve with a side of pasta (if you wish!) and enjoy! This recipe goes out to my Grandpa- eggplant is one of his favorites! And my grandma who taught my how to peel and salt the eggplant. -Use seasoned breadcrumbs for a super simple dish. If you only have unseasoned bread crumbs, season it up yourself! Add a 1/2 tsp. each of garlic powder, onion powder, and Italian seasonings and 1/4 tsp. of pepper and paprika. -Make the dish delightfully creamy and add some ricotta cheese in between each layer of eggplant. -This is a GREAT make-ahead meal. Follow all steps except the second baking of the layered casserole. Cover and keep in fridge for up to 24 hours. Bake in a 375 degree oven for 45 minutes or until cheese is melted and the dish is hot and bubbly. If you'd like to freeze the dish, cover WELL with plastic wrap and foil and place in freezer up to a few months. Defrost in the fridge for 24 hours. Remove plastic wrap and foil and bake in a 375 degree oven for 45 minutes. -Eggplants are best in the summer. Try cooking it with other tasty summer vegetables- layer the dish with thinly sliced tomatoes and fresh chopped basil! -Add more veggies! Slice 1/4" rounds of zucchini and/or summer squash and egg, bread, and cook just as the eggplant. -Why sprinkle with salt? Eggplants can sometimes taste slightly bitter. The salt draw out the liquid that causes the bitterness. Salting also helps cut down on the fat that can be absorbed into the vegetable. -To select a tasty eggplant, look for moderately sized eggplant (not too big, not too small). Skin should be smooth, shiny, and be firm to the touch. Make sure it has a green stem attached. 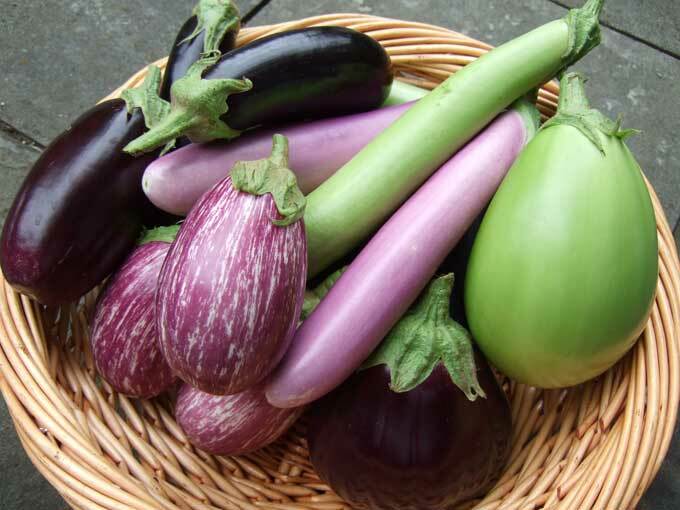 -There are many different types of eggplants. They range in color from purple to green to white, solid colored and striped, short and fat, or long and thin. All are tasty, I'd advice you to try a variety!